Did you read my article last week? I realize it’s probably a good idea to make the articles evergreen so that someone can come along and read them and have them be relevant at any time but this week I’m literally predicting the future and if I’m right, seeing price increase predictions after they happen is useless and if I’m wrong, I don’t want someone coming around after the fact and pointing that out. I want to count my hits and ignore my misses like everyone else. Lord Windgrace is the most popular deck this week as people seem to have shaken off their initial disappointment at how bad the precon is and have moved on to how good the one card is. There are opportunities for foil buys here for sure. $6 is way too cheap for this for a ton of reasons. First of all, and I hate to list this as a factor because I think saying this leads to really intellectually lazy thinking, but it’s insulated from some reprint risk given that it’s much tougher to reprint foils and EDH cards tend to end up in the precon decks where only the new commanders are foil. The fact that this is $3 on Card Kingdom means that people have identified it as an EDH card. However, typically when a card is identified as an EDH card, the multiplier is higher than 2x. For perspective, while this is bumped out of the Top 100 Green cards, it’s the #1 most-played Green Sorcery not in the Top 100. This is in more decks than Natural Order, Primal Command and Primal Surge. 2x means either the foil is too cheap or the non-foil is too expensive and one of those numbers will equilibrate barring a reprint. If you think it’s unlikely that a card in more decks than Primal Surge is going to go down in price barring a reprint, maybe scoop those last 2 $6 copies off of Card Kingdom and wait for it to hit $10, $12 or even $15 in the next year. Seems like free money to me. At $4.49, Card Kingdom wants the exact same amount for the non-foil as they do for the Gameday Promo. That points to a lot of supply and they list 8 for sale with potentially more in stock. Prices are dead even for all 3 version on TCG Player. Clearly there is a lot of supply. Do we expect a price divergence based on what we have seen with other cards that got a Gameday promo? Kiora’s follower is worth $0.50 more as a set foil. Promo Ghalta is worth $2 less than the set foil but the set foil is only $2 more than the non-foil. It seems like we have to go back a bit further. The set foil Wurmcoil Engine is worth twice the promo, a promo which is barely worth more than any non-foil copy of Wurmcoil despite multiple printings. Promo foils are pretty confusing. What I do know is that set foils are the most desirable and at $8, set foil Ramunap Excavator without the prerelease stamp is leading the pack but with the same art, I think $7 for the prerelease stamped Excavator is a good buy. Again, we have a 2x multiplier and while we expect that to diverge, we’re not seeing that even with a card that shrugged off multiple printings like Wurmcoil Engine. Curious. While foils are usually very desirable because when a 2x multiplier grows to 4x or so at the same time the base price doubles, you end up with an 8 fold increase in the difference between the prices which means it was four times as smart to buy the foil. The Gameday promo seems to confound that somewhat. 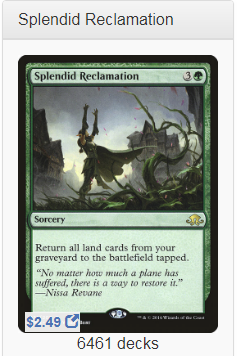 I think Excavator will continue to be a player in EDH and likely gets a reprint in the next 5 years but I am not such a huge fan of anything but the set foil – leave the promos alone. Conspiracy 2 is basically at peak supply and with boxes not moving at cost on eBay, it would take something like Leovold getting unbanned to move these. Meanwhile we have a pi x multiplier on a card that goes in every lands-matter deck built including Tatyova and whatever ends up coming out of Guilds of Ravnica with a bunch of Golgari junk filling our yards and letting us do powerful stuff with Crucible of Worlds. This seems like it has upside to me. $6ish is a high buy-in but I like this card a lot. Obviously this isn’t as good as Ninja of Deep Hours but the thing about Ninja of Deep Hours is that while Mistbalde Shinobi should be in every deck Ninja of Deep Hours is in when it comes to EDH, outside of EDH, Ninja of Deep Hours is better. 5 times better if the price difference is to be believed. I think Mistblade Shinobi is as good in Yuriko decks and besides, you need every ninja you can get. Mistblade has some room to go up whereas I am not excited about a $16 buy-in for Ninja of Deep Hours. If Yuriko continues to be a big deal, expect big things here. It’s funny to me that Invisible Stalker’s Hexproof may give it protection from reprints. Hexproof is a pretty annoying ability and I think they will use it very sparingly going forward in sets that will be played Limited and since we already returned to Innistrad and aren’t likely to again for 3 or 4 more years, I think outside of a core set, this is really safe and inside a core set, I don’t know if this get printed. I think we’re looking at a pretty decent insulation from reprinting and a card that enables Yuriko in a big way. Not much to say here other than that I think there is upside and not a lot of reprint risk. I will caution you by saying this is a bit more narrow than most of the picks I am advocating last week and this week. This belongs in every Yuriko deck but it’s only in 2,758 decks as of today. That puts it way at the bottom of the Top 50 Blue creatures, wedged between Perplexing Chimera and Roil Elemental. I think there is upside but I like this less than, for example, my call of $2 Arcane Denial from last week. There has been a bit more emphasis on tokens that are copies of creatures lately and this not only works well with Yuriko (you don’t have to copy the ciphered creature, you can copy anything) it also slots well into Brudiclad dekcs. 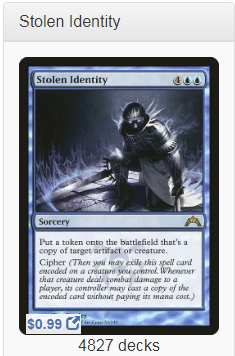 It’s a card people know about, it’s nearly impossible to reprint in foil and people know about it already. That’s more decks than Invisible Stalker and it has a 1.5x multiplier, which was a value we flagged last time we plotted all of the most popular EDH cards and tagged them with their multiplier. Not only is this in a lot of decks, but most of them are older. I think the appeal only goes up from here. Older commander are the primary reason this is about to crest 5k decks and with a ton of new reasons to make copies of creatures that are tokens, this card’s future is so bright it has to wear shades. At nearly the same price as the non-foil, this seems good to me. There are approximately a million of these foils lying around but at $1, the risk couldn’t be lower and hitting people with creatures, drawing cards and having a discard outlet all in one card is very appealing. Look, I clearly don’t know much about foils, but I like stuff like Stolen Identity and Key to the City that surprised me by how much past demand it had because I estimated the balance of its demand to be more recent. If its price is predicated on past demand, ample though it may be, future demand is about to run smack into it and shake things up. That’s what we want. That does it for me. If you want me to not do a part 3 next week, let me know now otherwise I’m inclined to. I had fun doing this and having to think about foils is forcing me to get better as a financier. My method takes it easy on my brain sometimes since everyone else is providing concrete numbers so I don’t have to rely on conjecture, so adding a new dimension to my game to keep me honed is important. Disagree with me? Agree with me? Leave some comments, nerds. Thanks for reading and if you want me to write about something specific next week, speak in the comments or forever be sad about it. Until next time! I’m curious why insidious will hasn’t gotten any attention yet.